IFAI Expo 2015: Thank You! What a terrific show! Thank you to everyone who attended this year's IFAI Expo. Southern California is near and dear to our hearts as we are proud to have an office just outside of LA and it was exciting to welcome everyone to sunny Anaheim. The show was a great success and our own Robert Hinsch, Vice President, was quoted in IFAI's show summary, "This has been a phenomenal show for us. It has really been a high-energy show, and we’ve had good, quality traffic." IFAI's president, Mary Hennessy, was excited about the turnout as well. "The show was a home run. Exhibitors and attendees raved about everything. Attendance was strong and steady, and the opening reception was awesome. Outside, beautiful weather, fun food trucks and lots and lots of people were icing on the cake. We are hearing nothing but positives!" Check out the complete show summary here and call us today to discuss your next project. 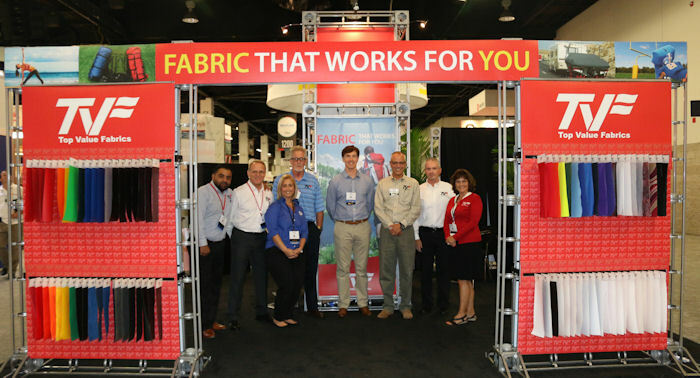 We love to help customers find the best solutions for their projects - and our wide variety of fabrics, weights, and finishes means that we've got you covered. Call us toll free to learn more or to request samples at 855.618.4500.